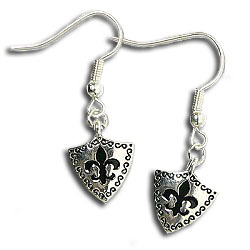 Petite fashion jewelry makes a big impact in these fleur-de-lis earrings. Dainty half inch shields dangle from fishhooks with recessed black fleur-de-lis designs contrasting with silver plating. An engraved pattern outlines the shields. Add appeal to your fleur-de-lis jewelry with the subtle statement of these wholesale earrings that hearken back to the Middle Ages with the shield design.